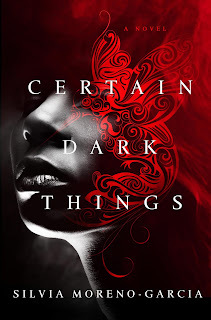 Thrilled to participate in the blog tour for Certain Dark Things by Silvia Moreno-Garica, today! 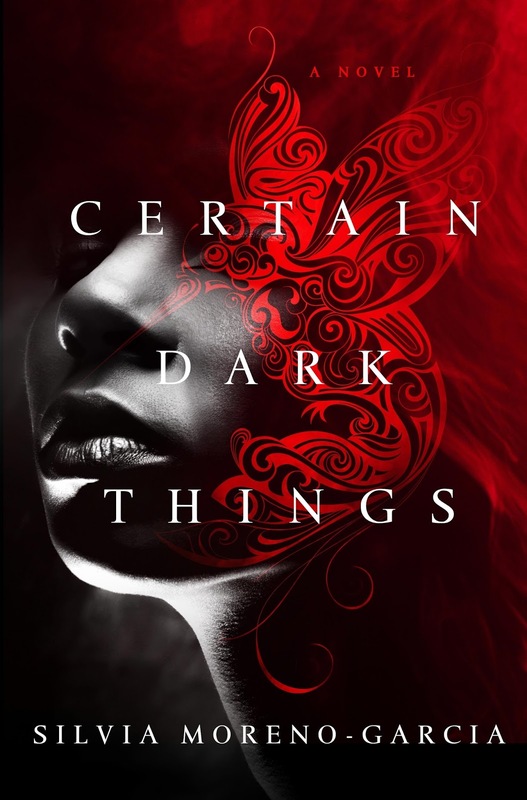 Domingo, a lonely garbage-collecting street kid, is busy eeking out a living when a jaded vampire on the run swoops into his life. The following is an excerpt from the book! Collecting garbage sharpens the senses. It allows us to notice what others do not see. Where most people would spy a pile of junk, the rag- and- bone man sees trea sure: empty bottles that might be dragged to the recycling center, computer innards that can be reused, furniture in decent shape. The garbage collector is alert. After all, this is a profession. Domingo was always looking for garbage and he was always looking at people. It was his hobby. The people were, not the garbage. He would walk around Mexico City in his long, yellow plastic jacket with its dozen pockets, head bobbed down, peeking up tostare at a random passerby. Domingo tossed a bottle into a plastic bag, then paused to observe the patrons eating at a restaurant. He gazed at the maids as they rose with the dawn and purchased bread at the bakery. He saw the people with shiny cars zoom by and the people without any cash jump onto the back of the bus, hanging with their nails and their grit to the metallic shell of the moving vehicle. Th at day, Domingo spent hours outside, pushing a shopping cart with his findings, listening to his portable music player. It got dark and he bought himself dinner at a taco stand. Then it started to rain, so he headed into the subway station. He was a big fan of the subway system. He used to sleep in the subway cars when he first left home. Those days were behind. He had a proper place to sleep now, and lately he collected junk for an important rag- and- bone man, focusing on gathering used thermo-plastic clothing. It was a bit harder to work the streets than it was to work a big landfill or ride the rumbling garbage trucks, sorting garbage as people stepped outside their houses and handed the collectors their plastic bags. A bit harder but not impossible, because there were small public trash bins downtown, because the restaurants left their garbage in the alleys behind them, and because people also littered the streets, not caring to chase the garbage trucks that made the rounds every other morning. A person with enough brains could make a living downtown, scavenging. Domingo didn’t think himself very smart, but he got by. He was well fed and he had enough money to buy tokens for the public baths once a week. He felt like he was really going places, but entertainment was still out of his reach. He had his comic books and graphic novels to keep him company, but most of the time, when he was bored, he would watch people as they walked around the subway lines. It was easy because few of them paid attention to the teenager leaning against the wall, backpack dangling from his left shoulder. Domingo, on the other hand, paid attention to everything. He constructed lives for the passengers who shuffled in front of him as he listened to his music. This one looked like a man who worked selling life insurance, the kind of man who opened and closed his briefcase dozens of times during the day, handing out pamphlets and explanations. Th at one was a secretary, but she was not with a good firm because her shoes were worn and cheap. Here came a con artist and there went a lovelorn house wife. Sometimes Domingo saw people and things that were a bit scarier. There were gangs roaming the subway lines, gangs of kids about his age, with their tight jeans and baseball caps, rowdy and loud and for the most part dedicated to petty crimes. He looked down when those boys went by, his hair falling over his face, and they didn’tsee him, because nobody saw him. It was just like with the regular passengers; Domingo melted into the tiles, the grime, the shadows. After an hour of people watching, Domingo went to look at the large TV screens in the concourse. There were six of them, displaying different shows. He spent fifteen minutes staring at Japanese music videos before it switched to the news. Six dismembered bodies found in Ciudad Juárez. Vampire drug wars rage on. Domingo read the headline slowly. Images flashed on the video screen of the subway station. Cops. Long shots of the bodies. The images dissolved, then showed a beautiful woman holding a can of soda in her hands. She winked at him. Domingo leaned against his cart and waited to see if the news show would expand on the drug war story. He was fond of yellow journalism. He also liked stories and comic books about vampires; they seemed exotic. There were no vampires in Mexico City: their kind had been a no-no for the past thirty years, ever since the old Federal District became a city- state, walling itself from the rest of the country. He still didn’t understand what a city- state was exactly, but it sounded important and the vampires stayed out. The next story was of a pop star, the singing sensation of the month, and then there was another ad, this one for a shoulder-bag computer. Domingo sulked and changed the tune on his music player.he looked at another screen with pictures of blue butterflies fluttering around. Domingo took a chocolate from his pocket and tore the wrapper. He wondered if he shouldn’t head to Quinto’s party. Quinto lived nearby, and though his home was a small apartment, they were throwing an all- night party on the roof, where there was plenty of space. But Quinto was friends with the Jackal, and Domingo didn’t want to see that guy. Besides, he’d probably have to contribute to the beer budget. It was the end of the month. Domingo was short on cash. A young woman wearing a black vinyl jacket walked by him. She was holding a leash with a genetically modified Doberman. It had to be genetically modified because it was too damn large to be a regular dog. The animal looked mean and had a green bioluminescent tattoo running down the left side of its head, the kind of decoration that was all the rage among the hip and young urbanites. Or so the screens in the subway concourse had informed Domingo, fashion shows and news reels always eager to reveal what was hot and what was not. That she’d tattooed her dog struck him as cute, although perhaps it was expected: if you had a genetically modified dog you wanted people to notice it. Domingo recognized her. He’d seen her twice before, walking around the concourse late at night, both times with her dog. The way she moved, heavy boots upon the white tiles, bob- cut black hair, with a regal stance, it made him think of water. Like she was gliding on water. She turned her head a small fraction, glancing at him. It was only a glance, but the way she did it made Domingo feel like he’d been doused with a bucket of ice. Domingo stuff ed the remaining chocolate back in his pocket, took off his headphones, and pushed his cart, boarding her subway car. He sat across from the girl and was able to get a better look at her. She was about his age, with dark eyes and a full, stern mouth. She possessed high cheekbones and sharp features. Overall, her face was imposing and aquiline. There was a striking quality about her, but her beauty was rather cutting compared to the faces of the models he’d viewed in the ads. And she was a beauty, with that black hair and the dark eyes and the way she stood, so damn graceful. He noticed her gloves. Black vinyl that matched the jacket.